Copyright Japan Environment Planning Co.,Ltd. All Rights Reserved. The Ministry of the Environment (MOE) in Japan announced on October 17, 2013, that it will conduct a pilot project called the "PLA-PLUS Project" (nicknamed "Pula-Pula") which collects waste plastic products at stores, something that has been carried out since 2011, with Japan Environment PLANning Co. serving as the secretariat . During this fiscal year, forty-six companies, including supermarkets, electronics retail stores, and specialty stores, are participating. 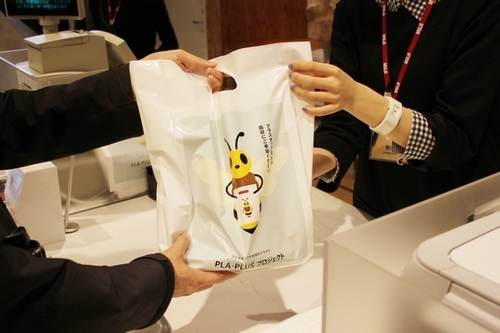 Starting November 15, 2013, the pilot project will operate for four months and will see plastic packaging from things such as stationery and toy products picked up from collection boxes in the stores of Aeon Retail Co., Ito-Yokado Co., Starbucks Coffee Japan Co., and other retailers. The project aims to resolve issues around collecting and recycling plastic waste products that would have otherwise ended up incinerated or landfilled instead of being separated and collected in many communities.